Personal Blocklist allows Google Chrome users to blacklist specific domains or pages from appearing in the Google search results. This can be helpful in situations where results from a website should not appear in the search results. This is usually the case if the website is malicious, spam or absolutely irrelevant to the search topic, or if you dislike it for another reason. 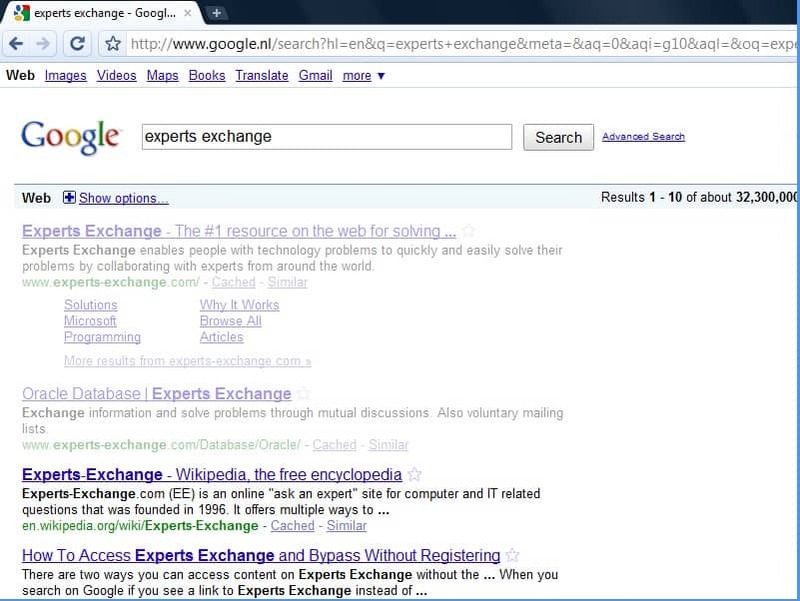 The developer mentions experts-exchange.com in the description of the Google Chrome extension as an example. The website could be a good example if the site would really block its content from users coming from search engines. We have already shown that it is possible to access all experts exchange content without being forced to register. But assuming there is a site that is protecting its content, or a malicious site or spam site, then it could be in the best interest of you to block those results from the search engine so that it won't bother you anymore in the future. The websites on the other hand are not blocked if they are opened directly. This makes the extension not suitable as a website blocker, but that was never the intention of the developer. New websites can be added to the Google blacklist by clicking on the Tools icon in the Google Chrome toolbar and there on the Extensions menu entry. A click on Options next to the Google Blacklist extension displays the configuration options. Urls can be added and removed in here easily. It is furthermore possible to make blacklisted results transparent instead of removing them completely from the search results. Interested users can download the Google Blacklist for the Chrome web browser at the Google Chrome Extensions gallery. The developer plans to include two interesting new features in future versions. The first is the ability to add websites to the blacklist directly from within the search results, the second to whitelist websites so that they are highlighted in the results. Please note that any blocked URL will be submitted to Google. Update: The extension is now called Personal Blocklist (by Google). Google has integrated it into search so that you can block domains directly here with a click on the block link displayed next to each search result. The extension supports international Google domains, and ships with options to import and export patterns, which can be useful if you want to make them available on other devices as well. Now this is one feature that might get me to switch from Firefox to Google. I’ll wait and see if they’d actually grown a conscience and pull out of China first, though. I have way too many cross-linked services with Google already. This will be excellent if there would be a Firefox extension. Personally, I am sick and tired of the ignorant and disgusting contents from Urban Dictionary.